Blogs are a great way to let more people know who you are and what you’re up, attracting more customers to your business. With blogs, the sky is the limit – they can be simple or complex, colorful or professional, with short or long posts, engaging your audience in various ways. Blogs can even turn into a main source of income for some freelancers. However, building up a great blog can be challenging. The worst thing that can happen is the failure to attract traffic. Putting in all that effort without an audience is more than disappointing. There are a lot of ways to avoid that and not everything works for everyone. Here are eight of the best ways to attract more readers for your freelance blog, it is up to you to figure out what best suits your blog. Make sure you don’t skip number 8 for an exclusive tip to an upcoming event. 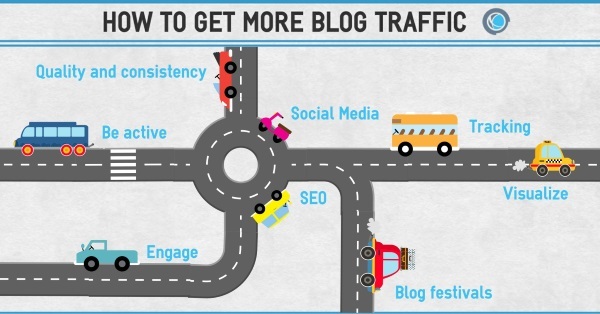 This first step is an absolute must if you’re serious about building up a blog. Quality and consistency are the two elements that every blog needs to be successful – one cannot do without the other. Post often, once a week at the very least. If people stop seeing new content they will stop visiting your page. Posting just for the sake of it doesn’t work either. The abundance of choice online makes readers merciless - one or two bad posts can often be enough for them to leave. Popular communities can be a gateway to more readers. Whether it is news websites, other blogs or comment sections of any other variety, you have to show your blog to the world. Be helpful, constructively add to the discussion or impress with insight and don’t forget to mention your blog. Other communities are great for attracting new people, but your own audience is what matters most. Retain those readers by communicating with them in every possible way. Be as quick and precise as you can with answers to any questions that they might have. Also encourage them to share your content and don’t forget to thank them for sticking around. Search engine optimization (SEO) can sometimes sound scary, but with a bit of reading and some extra software anyone can do it. To get started, check out our ultimate Wordpress SEO checklist, most of which can be applied to any website. Social media spreads your posts quicker than anything else so make sure that option is available. Whether it is Twitter, Facebook, Reddit, Google+ or whatever other online community, link your content there to potentially expand your audience immensely. A blog requires a lot of attention. As there are only so many hours in the day, you should focus that attention. Make sure you use tools like Google Analytics to know exactly where people find your content, which countries your readers come from, how old they are and so on. Using that information, you can produce targeted content that appeals to your audience. An infographic, a cool video or a vivid image are cool attention-grabbers that are much more likely to be shared than a three-page article. This doesn’t mean that you should fill your blog with low quality content, but be aware of the power that visuals can have and utilize it. Blog festivals are another excellent way to participate in other communities, exchange ideas and have fun with fellow bloggers and their readers. A little bird has just told me that a blog festival might be brewing right here at Freelancermap, so stay tuned for more updates!